Imagine as a male being the last of your kind: you, two females, and a handful of other creatures surrounding you. 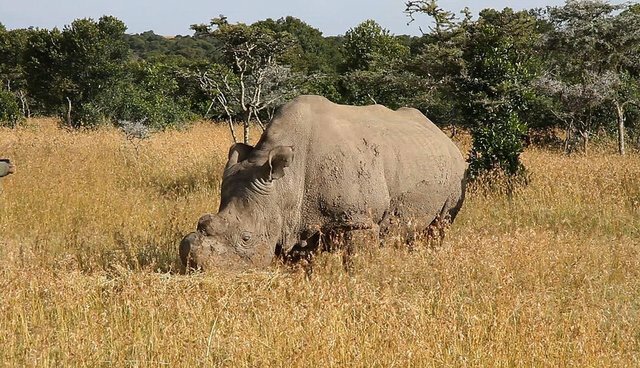 This is the life of Sudan, the last male northern white rhino on the planet. Where most white rhinos are munching on grass, this is not his favorite; as he prefers lucerne (alfalfa), carrots, bananas and pellets. And why not? As the one and only of his kind, shouldn't he get his favorites? His relaxation and comfort only waver with an unfamiliar person's scent in his presence or when he is startled, like being approached from behind. Like many animals, the unfamiliar agitates him. These are his days - fed, secure, cared for until the end. But the end is coming too soon. And the end of Sudan symbolized the extinction of the Northern White Rhinos. 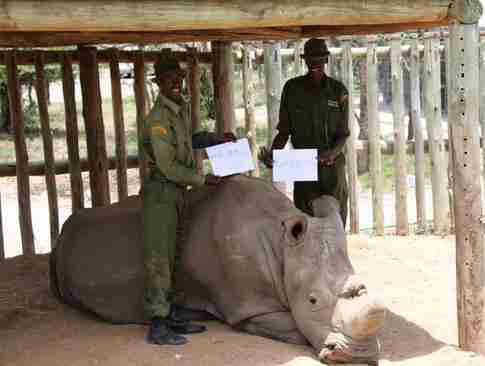 October 2014: Suni, the male at Ol Pejeta died at 34. December 2014: Angalifu, the male at San Diego died at 44. There's no way to truly ascertain this. But we try to the extent that is possible to ensure that he is not alone. 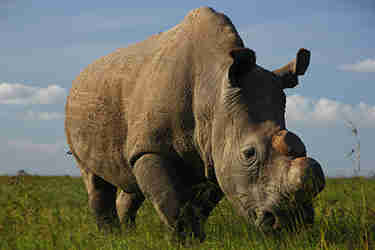 He is always in the company of his keepers or his sister rhinos, Najin and Fatu. Ol Pejeta is caring for these precious rhinos, as well as being the largest black rhino sanctuary in East Africa. Fight for Rhinos supports their efforts. To help, please donate to Fight for Rhinos or to Ol Pejeta's Running for Rhinos campaign. For more on the northern whites: "Watching the Sun Set on a Species" and "What Happened to the Northern Whites?"